Yesterday, Bloomingdale's on 59th street celebrated the 100% Bloomingdale's collection including 1,000 new fall exclusives. Guests flocked for a chance to see Nina Garcia and Tommy Hilfiger, as well as Aimee Song, who posted with a bunch of Instagram fans. 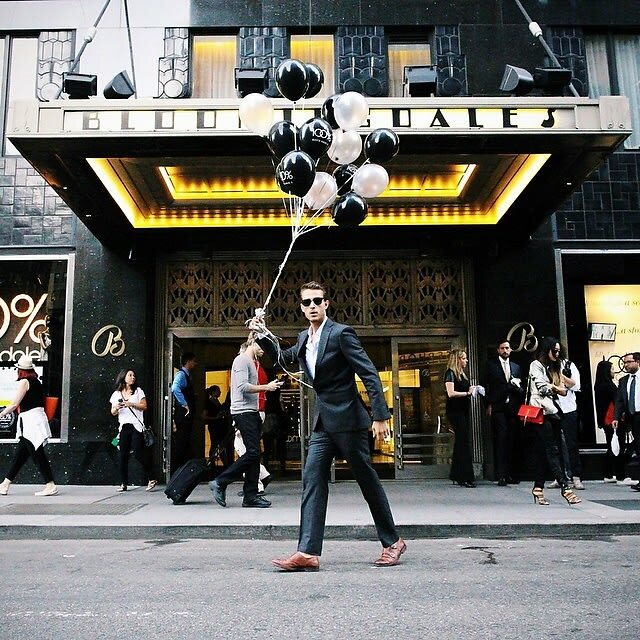 Later, guests and models took to the streets for photos with black and white Bloomingdale's balloons. Check out the slideshow for more photos! Who was there: Guests included Kat Irlin, Aimee Song, Tony Spring, Tommy Hilfiger, Natalie Amrossi, Adam Gallagher, Anne Keating, Carolyn Rafaelian, Petra Nemcova, Terry Lundgren, Erica Russo, Frank Doroff, Gary Sheinbaum, Brooke Neidich, Harold Koplewicz, Jim Shay, Nina Garcia, Christian Hosford, Dorothy Kiely, Frank Berman, Kevin Harter, Lori Griffith, Samantha Green, Tina Lundgren, DJ Stef Nava, Josh Peskowitz, Julia Engel, Megan DiCiurcio, Thomas Berolzheimer, and more.